Desperate for the Internet to be all it could be, I gravitated toward analytics after trying to combine design, usability and information architecture into a logical, integrated way to build a better customer experience. These disciplines were each as complex and as individual as the next. If only there were a unified way of organizing and creating a website so that de facto standards could be replaced with standard, rational menus and buttons and process flow. Why does every shopping cart have to be a puzzle to the customer? When I saw Accrue, NetGenesis, Omniture, WebSideStory and WebTrends, I realized the answer was at hand: We could measure which methods and buttons and meus were best! That led Matt Cutler, founder of NetGenesis, and I to team up on a white paper: “E-Metrics – Business Metrics For The New Economy”. That led to a book called Web Metrics , which led to the eMetrics Summit. The first eMetrics Summit in 2002 in Santa Barbara, California was very exciting. Everybody was thrilled to discover that they were not the only ones who understood the language and the possibilities and the difficulties. We had found ‘our people’. In the early days of the eMetrics Summit, we discussed the value of page tagging versus log files analysis versus packet sniffing. We shared actual case studies of A/B split testing and using email to fuel customer loyalty. New technologies were emerging in real time and the vendors paid very close attention to everything the practitioners and consultants had to say. In 2004, the eMetrics Summit was the birth place of the Digital Analytics Association (then the Web Analytics Association). Within a couple of years, the eMetrics Summit spread to Washington, D.C., London and Germany. In time, we would share insights about an analytics organization works within a larger company; how the business side of the company learns about the value of analytics; how to create a Center of Analytics Excellence; how to deal with data silos and the need for omnichannel data integration. Soon, companies like Ford and Dell were describing how the insights coming out of their online analytics tools were powerful enough to impact decisions the corporation made about offline marketing, distribution and market expansion. Then, in 2009, we suffered the year of the Great Economic Crisis. That meant the bean counters were coming out from behind their spreadsheets, tipping up their green eye shades and asking tough questions about the ROI of marketing in general and this strange, new Internet thing in particular. Those who had mastered the analytics of their digital marketing had the answers. Others did not fare as well. The eMetrics Summit was joined in 2011 by Predictive Analytics World, the Conversion Conference, Text Analytics Word and the Google Analytics User Great Experience (GAUGE) under the banner of Data Driven Business. This was a clear signal to those who would leverage their data for competitive advantage that their time had come. 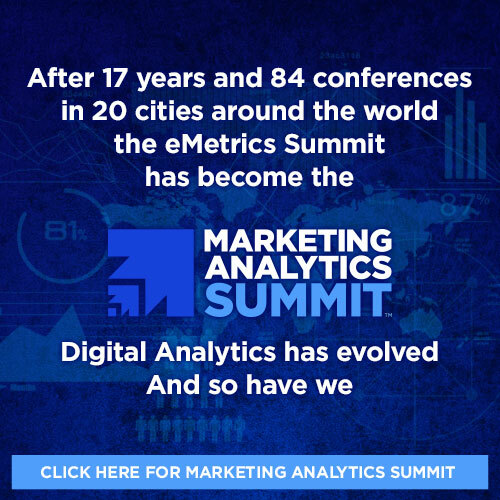 Social media, mobile, data democratization, attribution, visualization, programmatic advertising and Big Data became the deep-dive topics of discussion that propel the eMetrics Summit to this day. What are the latest best practices and tools? What new data sets should we be integrating? How is customer behavior with new devices changing? What’s the right mix of optimization and testing vs. discovery? Where do we find talented analysts? How do we organize our teams? How do we get the most out of the data we have? The answers seemed to be found at the eMetrics Summit. This is the conference that brought together an industry. The vendors, consultants and practitioners came together to help each other and move our knowledge forward. It seems that leveraging customer data to drive business strategy is a strategic imperative for companies. Whether they are employing more technologies or more data scientists, worrying about data protection and privacy, or trying to fathom how data from the Internet of Things will feed machine learning for marketing engines, the eMetrics Summit continues to be the place where people come to exchange ideas and grow their personal/professional networks. It is the place for marketing professionals who wish to make better decisions, informed by data rather than by hope. Join us to see how far we’ve come and where we’re headed.